20-April, 2017 (Thursday) Fruit Twilight Meeting at 5:30 PM. Phantom Farms, 2920 Diamond Hill Road, Cumberland, RI. 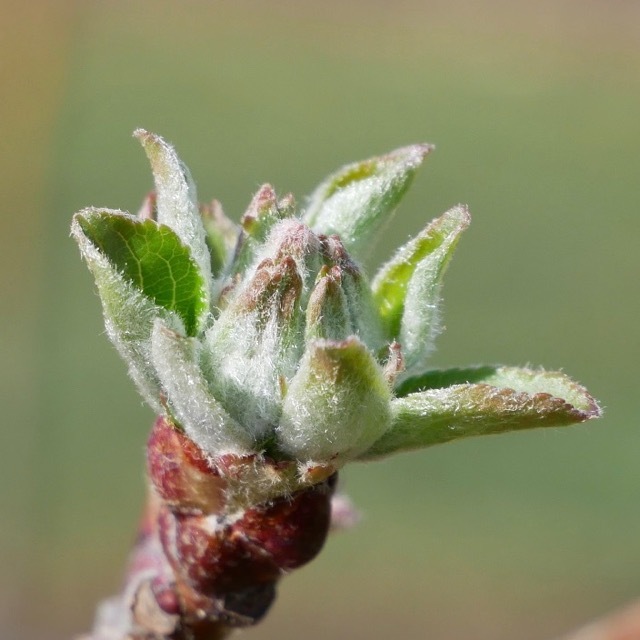 In cooperation with Rhode Island Fruit Growers' Association. Terry Bradshaw, from the University of Vermont will share his expertise on orchard weed control, focusing on non-herbicide control. Two hours of pesticide credit should be available (pending) and a light dinner will be served. The meeting is free for RIFGA members and $20 for non-members. Contact: Heather Faubert, 401-874-2967 or Jon Clements, 413-478-7219. Pre-registration is not necessary. • An ABBREVIATED version of Healthy Fruit this week. But this WILL absolutely be your last Healthy Fruit (HF), unless go to the UMass Extension Bookstore (http://umassextensionbookstore.com) and purchase a new 2017 subscription to HF ($50, e-mail delivery only) in the next week or two. Alternately, you can send me (Jon Clements, 393 Sabin St., Belchertown, MA 01007) a check for $50 (tips accepted) made out to 'University of Massachusetts.' Make sure you note it is for Healthy Fruit subscription, and includes your e-mail address. You can also use this mail-in form to order Healthy Fruit and other UMass fruit publications. You can ignore this of course if you have already sent in your payment. Thanks. 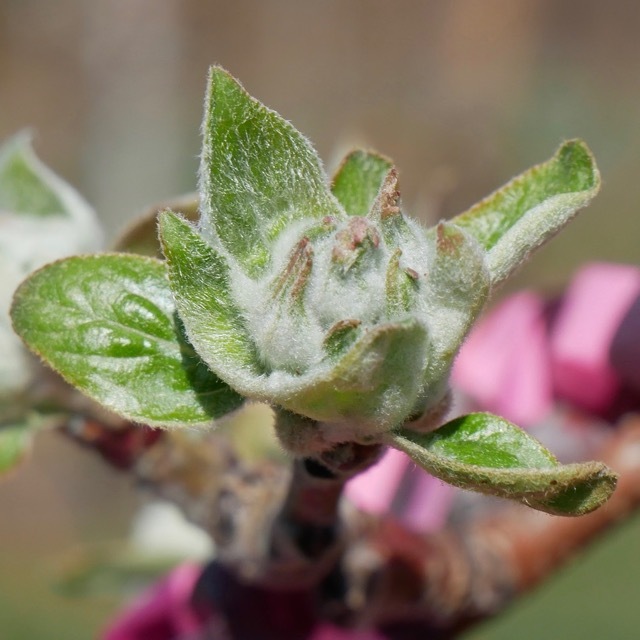 • There WILL be a significant apple scab infection event for most of you later this week assuming the forecast holds. Apples are at tight cluster in Belchertown, and plenty of foliage out there now to get infected should there be spore release. That copper spray is not going to cut it, be covered up with a mancozeb fungicide. Or Syllit (ugh, DANGER signal word), or Captan/captozeb if you have not sprayed oil in the last week. You can even spray a mancozeb once the rain starts, although not pouring rain. Scala and Vangard are other options with better post-infection activity. Be prepared, an ounce of prevention is worth a pound of cure. • It's not too late to apply oil for mites and scale (and pear psylla) if you have not already done it, but reduce rates down to 1.5%. 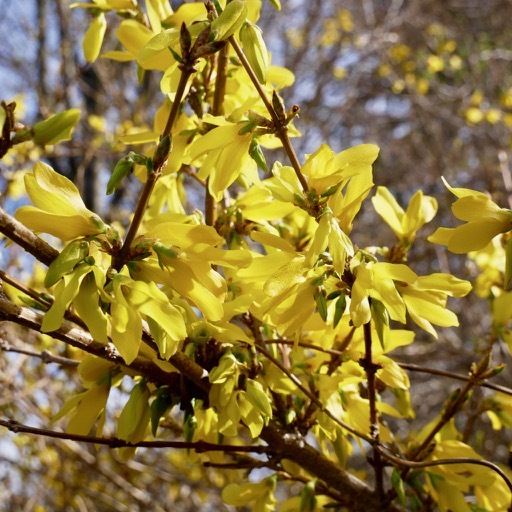 • Forsythia are in bloom, so any time you have a chance now is a good time to apply one of many pre-emergent herbicides such as Alion (trees in 4th leaf or older), Chateau (pre-bud break),and Prowl H2O. Diuron (Karmex) is also a legacy pre-emergent herbicide with good activity against broadleaf weeds, but use reduced rates on dwarf trees and/or light soil. • Open bloom (or at late pink, ready to open) on stone fruit (peaches, plums, and cherries) should be covered with a brown rot fungicide. See Dan Cooley's Disease comments below. • Hope to see some of you down in Rhode Island on Thursday for the twilight meeting at Phantom Farms. Peach flowers look good in Massachusetts this year. 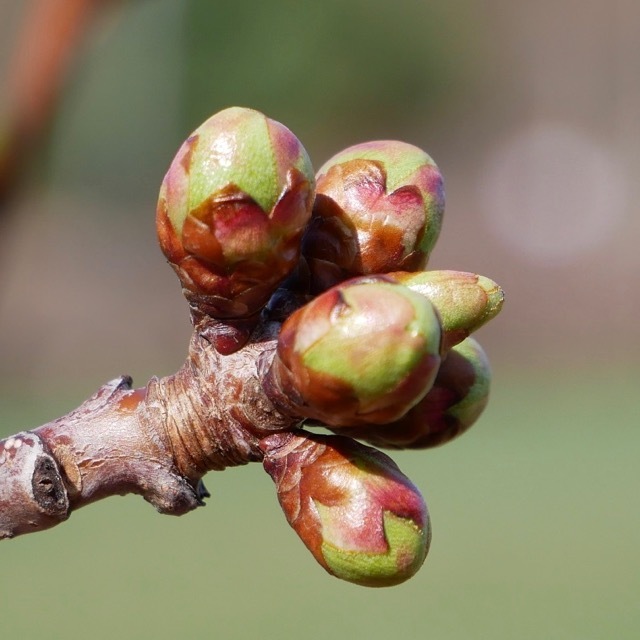 From a disease perspective, the year off from fruiting may offer some benefits, at least for brown rot management. There won’t be any mummies left in the tree or under the tree from last year’s crop! But the fungus will undoubtedly still be around. 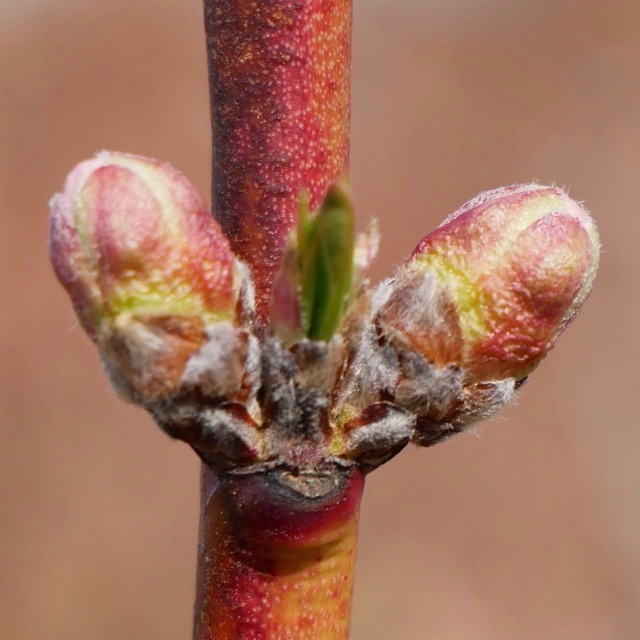 As peaches come into bloom, it’s important to protect against brown rot. 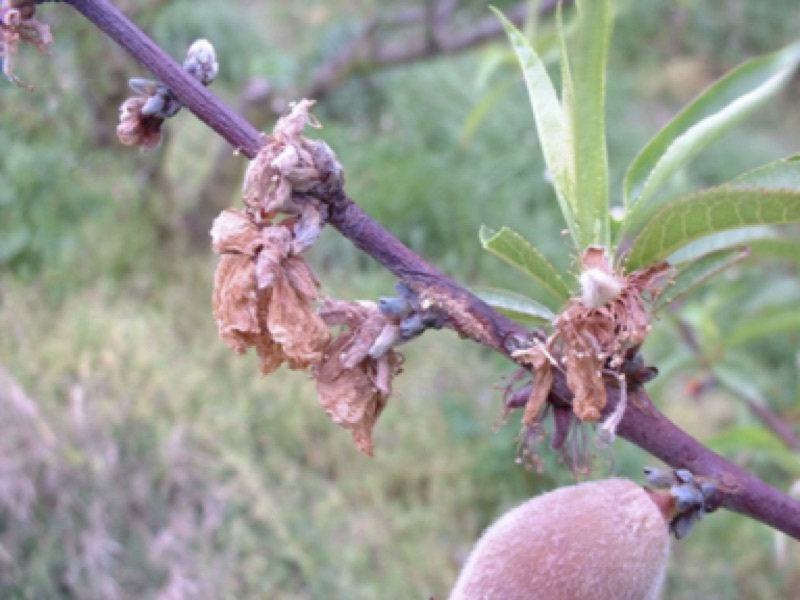 There are a lot of fungicides registered for use against peach brown rot. 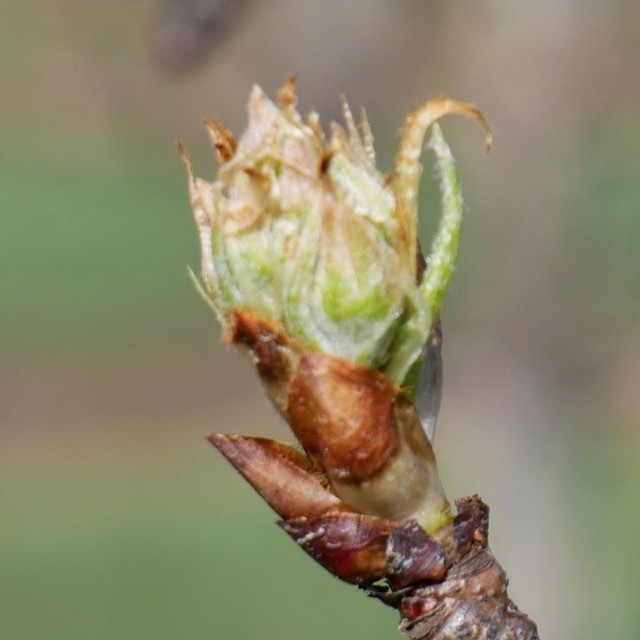 Unfortunately the brown rot fungus has developed resistance to some of these in New York and New England, and to keep that situation from worsening, and avoid brown rot outbreaks, pay attention to fungicide resistance management. For this reason, it’s recommended to reserve the effective systemic fungicides for fruit rot management, on fruit after pit hardening. For now, from pink through to shuck split, chlorothalonil, sold as Bravo, Echo or Equus, provides good protection against blossom blight. Since it’s a multi-site fungicide, the brown rot fungus is very unlikely to ever develop resistance to it. 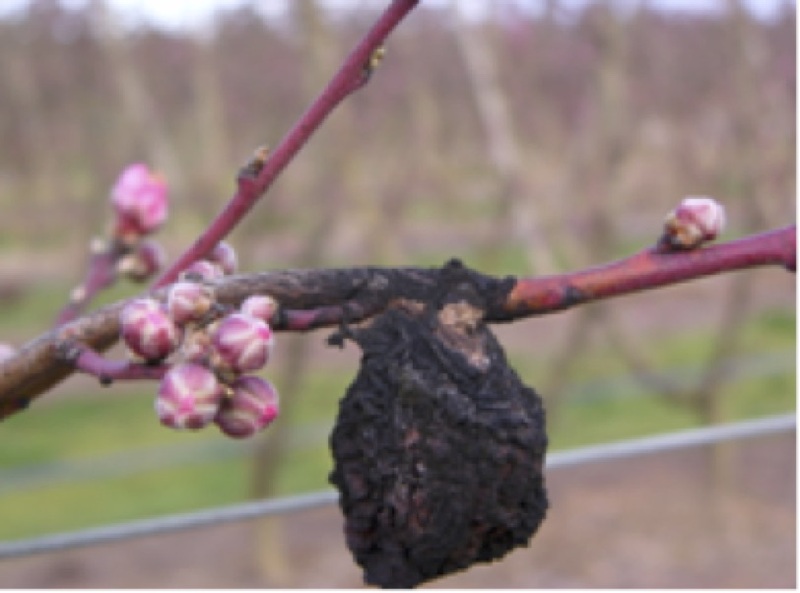 Captan is also a multi-site fungicide that can be used, but can sometimes damage peaches. Apply these protectants before forecast rain. After shuck-split, shift to the systemic products. A quick reminder that if you’ve had bacterial spot problems, early season copper, even during pink and early bloom, can help. However, keep rates lower than those applied on dormant peaches. Use 1.5 lb. of metallic Cu at pink, and 1 lb. metallic Cu at early bloom. Copper comes in many formulations, with varying amounts of metallic copper. Read the label, and calculate the amount needed for the material you have. The next Healthy Fruit will be published on Tuesday, April 25 or thereabouts, 2017. As always feel free to get in touch with any member of the UMass Fruit Team (http://extension.umass.edu/fruitadvisor/team-members) if you have questions or comments.